With over 40 years of proven solutions in the air conditioning industry, Toshiba is one of the key players in the market. Few are aware that it was actually Toshiba that first introduced “Inverter” systems in 1981, and it has since maintained a technological advantage over it’s competitors. With it’s roots going back to 1875, Toshiba has become one of the leading air conditioning brands. Over 30 years of innovation, and consistently supplying the market with top quality air conditioners, has established for Toshiba a proven track record in the air conditioning industry. Little known to most, Toshiba as in fact the first company to introduce the Inverter technology into air conditioning systems in 1981. It has since developed a proprietary DC Inverter Technology that is unique to it’s range of air conditioners. To this day, Toshiba holds true to it’s corporate philosophy of : No Compromise – Only Quality. As a company, Toshiba is very focused on environmental protection. Hence, besides offering some of the best features and performance in it’s products, the company also heavily invests into pushing the boundaries further on two fronts : energy efficiency and reducing greenhouse gas emmissions. Below we review the Toshiba Hi-Wall Split System air conditioning range, looking into all of it’s features and benefits. Toshiba split system air conditioners provide you with the multiple benefits of energy saving, comfort and high cooling power. Toshiba’s range of split system air conditioners are designed for flexibility in application and with a low operating sound level and improved air quality. So you get all round comfort plus precise temperature control, in a split system air conditioner which is sleek, stylish and backed by the famous Toshiba Air Conditioning warranty and support. Innovative technology, ingenious features and attractive design – Toshiba raises the standard of air conditioning yet again with a new level of comfort in the Toshiba wall split air conditioner range. Comfort comes with the whisper- quiet operation and optimum airflow management system, whilst the new filtration system allows you to breathe cleaner air. Toshiba split system air conditioners operates with a low noise level of just 29dB(A) in cooling only mode (size 10) for comfortable nights. It also offers you a “Hi-power” choice so you can reach your optimal temperature as quickly as possible. Better still, you will be able to use a one touch pre-set memory to call up your favourite setting. It’s easy and effective technology that is available at your fingertips when you choose a split system air conditioner from the Toshiba range at Jims Heating and Cooling. Enhanced 7-in-1 Filtration: Super Steriliser filter with Sasa, Bio-Enzyme + Super Gingko; Super Oxi Deo filter with Vitamin C, coffee bean extract + Super Zeolite; Active Carbon + Catechin filter to deodorise and purify.Latest Digital Hybrid Inverter technology for increased energy efficiency, optimised comfort and superior reliability. Toshiba split system air conditioner has it all in a stylish, practical design that offers you luxury air conditioning without a luxury price tag. It is a product we are proud to include in our extensive range. 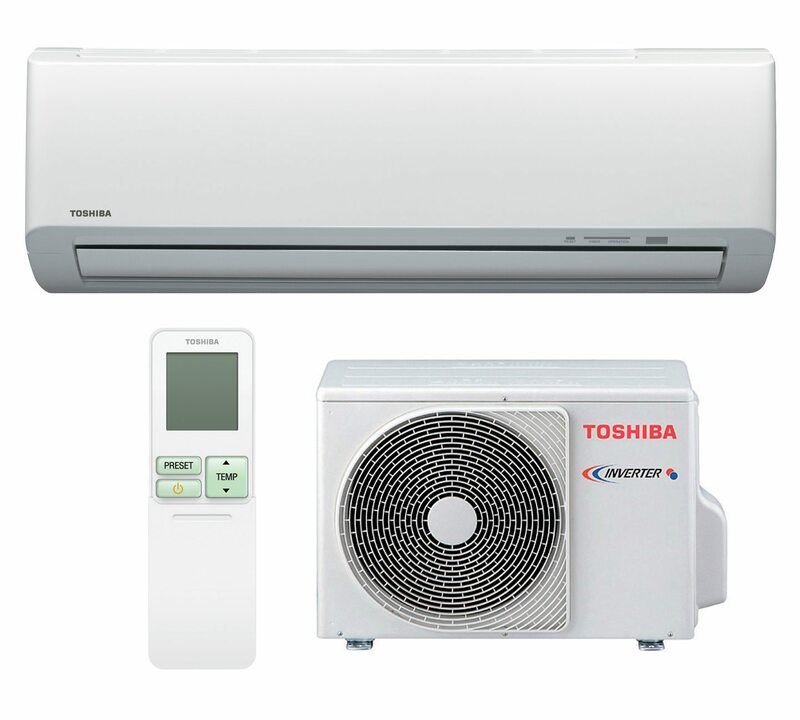 Air conditioning systems by Toshiba today – especially the Hi-Wall Split System air conditioning and Ducted Reverse Cycle air conditioners, are very popular and highly demanded by new and existing home owners. In this post, we will review the key benefits of Toshiba. Toshiba leads the air conditioning industry with many technological advances that are unique to it’s brand. Innovation thrives within the company – and it continues to deliver on new technologies such as it’s Hybrid Inverter System, it’s Technology For Health (Plasma Ionizer filtering system) and in-built Self Cleaning Technology. Let’s review these, and more, in details below. Toshiba’s hybrid inverter system incorporate two distinct compressor control modules. A Pulse Amplitude Modulation (PAM) and a Pulse Width Modulation (PWM). The PAM module is like the Turbo function in a car, and is used to kick the compressor into maximum mode, in order to rapidly cool down a room. Once the temperatures reaches down to a level that is preset by the user (say 16 degrees), the PWM kicks in like the cruise control on a car. PWM significantly throttles the power consumption down by scaling down the cooling power – allowing the compressor to work at a much lower power mode. Modern day inverter systems all accomplish this power throttling via different implementations of the inverter technology. It is important to remember though, that Toshiba was the first to innovate on inverter technologies, and the implementation of the dual compressor modules accomplished this to great effect. Toshiba’s dual or hybrid inverter technology significantly increases operating and energy efficieny, and greatly reduces noise emmissions. In short, Toshiba delivers excellent performence, that is reliable, efficient and quiet. Incorporated into each Toshiba wall split system air conditioning, is an ionizer technology that introduces negative ions into the cooled air. These negatives are reknown to create fresh and healthier environments, by absorbing and decomposing contaminants such as smoke, food smells and other undesirables such as bad odours. 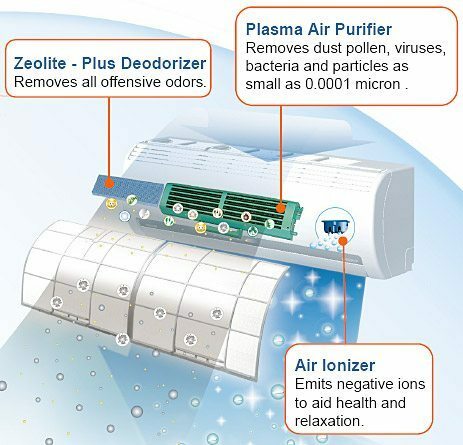 In addition, Toshiba has also incorporated a Plasma Ion Purifier System, that cleans air passing through the system. Just like how air purifiers work. An IAQ filter technology also dramatically inhibits the reproductive capacity of bacteria and viruses (such as the H5N1 Avian Influenza). This means that your family can enjoy cleaner, healthier air – that also reduces the chance of falling ill.
For many air conditioners, it is important to keep the air conditioning filters clean. Regularly maintenance is required to remove dust and mould from the filters, so the air conditioner can continue to throw out clean air. However, mould can quickly clog up the filters, and if not properly maintained, these dirty filters can create a harmful environment for your family. Toshiba air conditioners feature anti-mould high performance filters that, not only blocks dust, but also are chemically treated to minimizes the formation of mould. In addition to all the above features, Toshiba also features a Self Cleaning Technology that significantly reduces the formation of mould. Mould is usually formed when an air conditioner is turned off, and moisture is trapped between the grill blades and on the air conditioning filter. Toshiba split systems incorporate an internal fan that continues to work for 20 minutes after the air con is turned off – drying out the fan grills and filter to prevent mould formation. Energy efficient is foremost with Toshiba air conditioning systems. 3 Power select modes allow users to choose the power consumption mode of they liking. From 100%, to 75% to 50%. This allows users to customize a good balance between comfort and power costs. Toshiba also features and Eco-logic technology that reduces raises the temperature by 1 degree after 1 hour of operation, and then another degree after the 2nd hour. Then it just maintains that temperature till the air conditioner is turned off. Over the long run, this is tested to provide up to 25% energy savings for a user! In addition to the explicit energy conservation features above, the hybrid inverter is also tested to perform with a high level of efficiency. For all these reasons, Toshiba air conditioning systems have some of the highest energy star ratings in the industry. Like other air conditioning brands, Toshiba offers many advanced climate control features. From highly customizable temperature and power mode settings, to fan speed & louvre settings to zoning (for ducted systems), Toshiba offers most of the features other brands offer. Unique to Toshiba though is an added 3D-Airflow technology that allows it’s wall split systems to distribute airflow in 6 distinct airflow patterns. This allows the system to focus the cooling of a room to where it is needed. For instance, airflow can be focused on a corner of the room where a lounge or sofa is located. The 3D mode can also be set to rotate – which evenly cools a room. Toshiba wall split system air conditioners have a feature called Self Cleaning. This function reduces the overall humidity in the system. Humidity is what causes mould to form in the air conditioner. The accumulation of mould impairs the performance of the air conditioner and necessitates more frequent servicing. With the self cleaning feature, an internal fan automatically activates the moment you switch off the air conditioner, effectively drying out the coil and fan blades. This eliminates the moisture which causes mould to form. Although this seems like a small feature, it makes a big difference in keeping the air conditioner at optimal performance. This feature is quite unique to Toshiba wall split system air conditioning. Toshiba conducts research to assess user preferences in different regions of the world. A One Touch My Comfort feature allows you to click a single button, and the air conditioner will be set to a climate setting that is pre-configured to suit your region best. This is quite innovative and delivers to the user a one-click convenience to gaining maximum comfort. A special preset function that allows you to pre-configure and save to memory your preferred climate settings. This includes temperature, power modes, fan speed, louvre positions, and much more. You will be able to pick a set of climate conditions that suits you best, save it and recall it for future convenience. Clicking a single button will set the Toshiba split system air conditioner according to your preset settings. Toshiba air conditioning systems come very competitively priced. Given it’s many unique features, energy saving technology and proven performance, it offers a great balance between price and performance. Not the cheapest in the market, but certainly not a premiumly priced brand like Mitsubishi. Different home owners has different priorities. And at Jim’s Heating and Cooling, we recommend customized solutions according to those priorities and needs. If your objective is to get the most premium brand, you could consider going for Mitsubishi, which has excellent features but comes in at a price 20-30% higher than other brands, Toshiba included. If your objective is to get a a system with excellent performance, but that won’t set you back as much in upfront costs, Toshiba would be a good recommendation. Toshiba continues to be one of the top performing systems, and comes with many advanced features. It is also one of the most energy efficient brands in the market. This review is intended to inform the reader and is offered to readers as a goodwill. We will not be liable for any costs or damages that may arise from the use of this information. Do your own research before making purchase decision. At Jims Heating and Cooling, we know you won’t be disappointed and we look forward to visiting your home today to offer you a FREE quote that will meet your everyday lifestyle. When you choose Jims Heating and Cooling as your preferred installer, you are choosing to go with a South Australian Icon. As a family owned company we know the local industry better than most and we also know how important it is to stay cool during the harsh South Australian summers. Plus, we are proud to employ the best heating and cooling technicians in the business. They know what they’re doing and won’t let you down, and, in the unlikely event that something goes wrong, our backup and service support is just a phone call away.